Welcome Beyond is our ‘hand-picked paradise’ for travelling; a travel site with a perspective in jet-set travelling offering one-of-a-kind destinations. Welcome Beyond shares the philosophy that where you stay is as vital to the experience as what you see and do – and we couldn’t agree with them more. 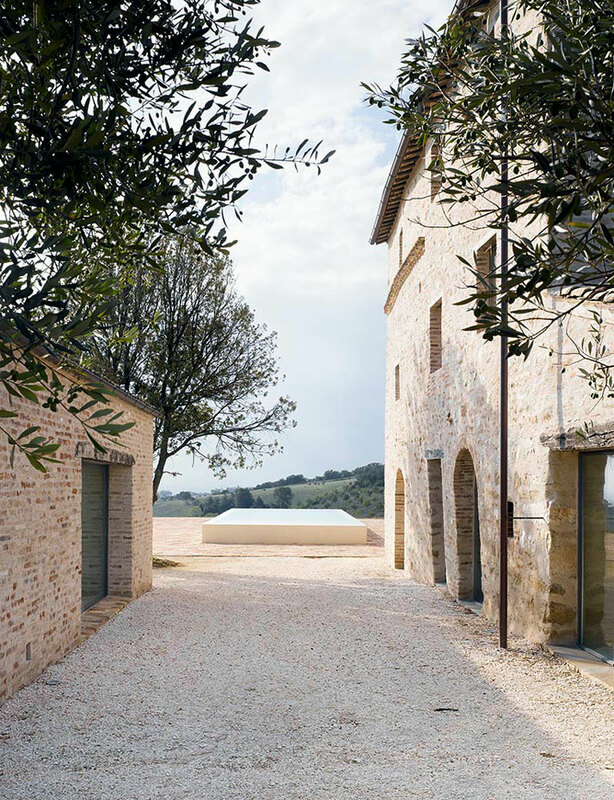 This time, Yatzer’s hand-picked selection is a restored 300 years old farm house located in Treia, a town in the province of Macerata in the central Marche, Italy. 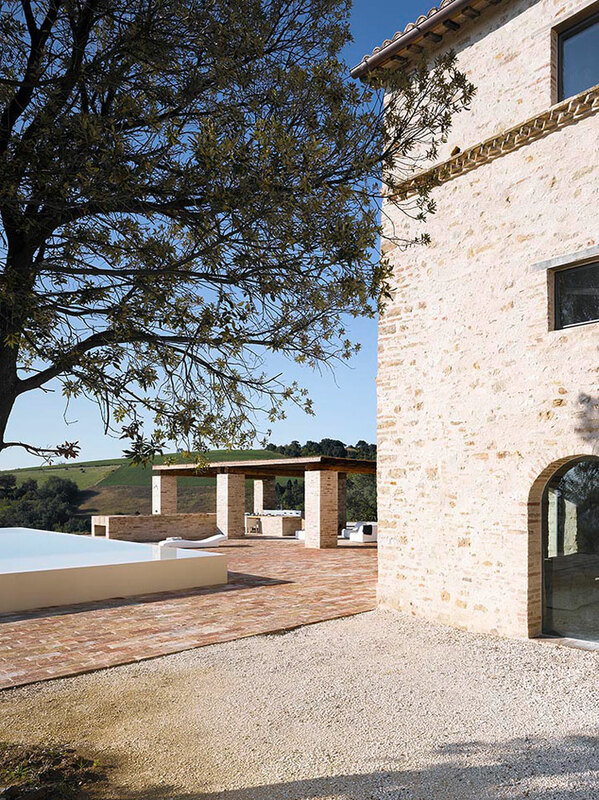 Le Marche Villa is conveniently located 12 kilometers from Treia, and was restored in 2006 by the Caviano-based studio Wespi de Meuron Architekten. 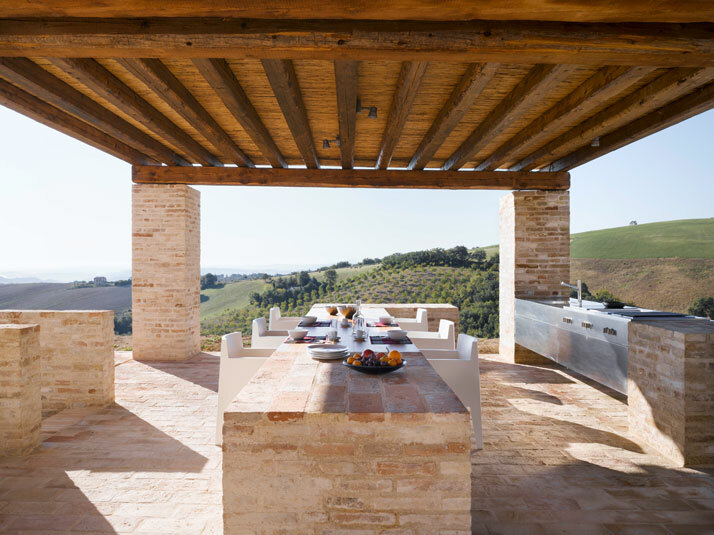 Located amidst hills of olive groves, fruit plantations and sunflower fields, the Le Marche Villa offers panoramic landscape views all the way to the Adriatic coastline. Offering a unique experience which will cleanse your body and soul, this holiday house seems like the ideal retreat for anyone who wants to enjoy nature and take time off from their busy city life. Of course there’s plenty to do, as surrounding villages have a lot to offer cultural-wise – from museums and old churches to theaters and the long tradition and history of the Italian countryside. But if you want to enjoy this luxury villa and make the most of what it has to offer, you can treat yourself to some de rigueur sunbathing, swimming in the pool or indulge yourself in succulent Italian flavors by participating in cooking classes provided at the property by a local chef. Moreover, you can enjoy olive oil tasting from regional olive trees, as well as wine tasting as two sommeliers are available to organize an unforgettable experience for you and your guests. But let’s take a closer look at the property – the 300 years old farmhouse was in ruins when it was discovered by its current owners in 2005. 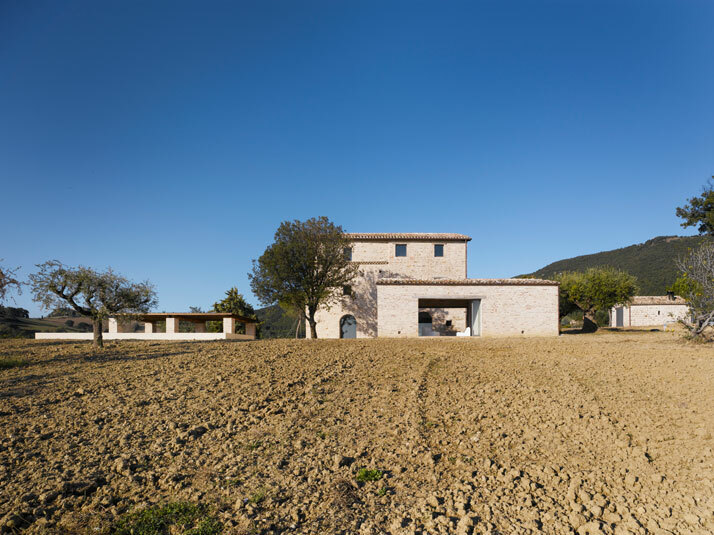 After one year of trying to find the right architects to assign the restoration of the project to, the owners commissioned Caviano-based studio Wespi de Meuron Architekten in 2006. 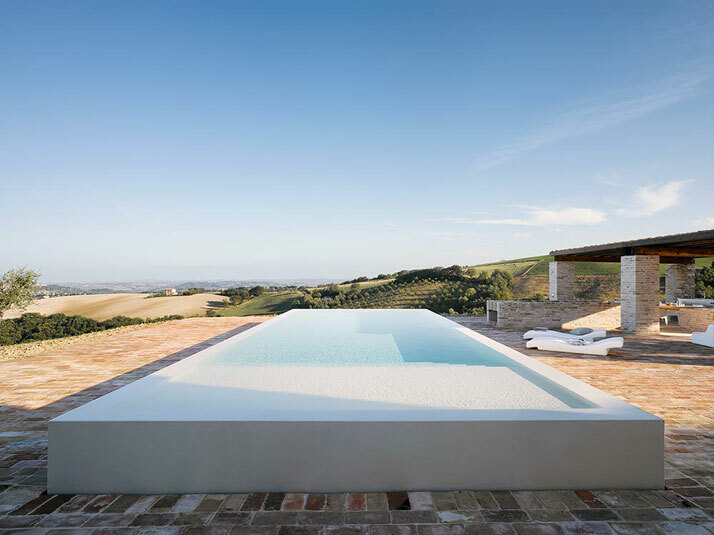 After four years of hard work and carefully selected materials the restoration of the house was completed in 2010 resulting in a contemporary dwelling and holiday house, with attached guest house and pool. 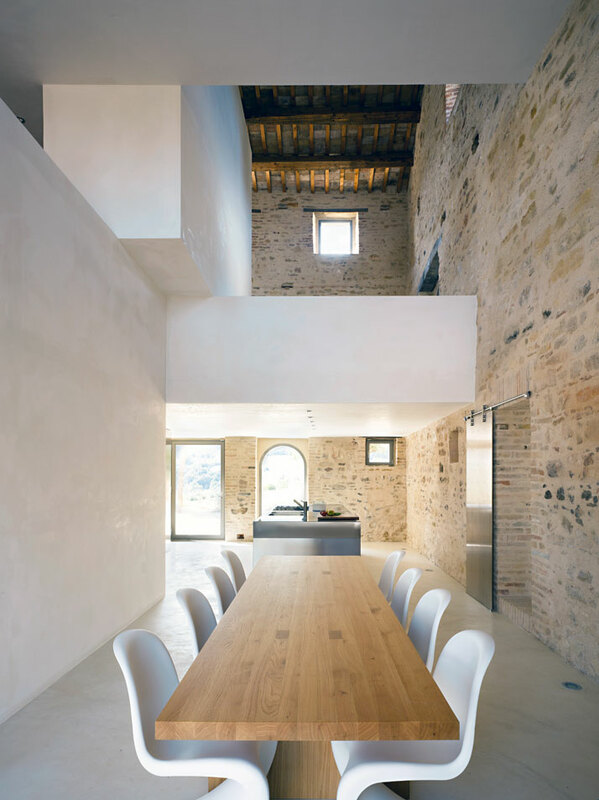 The farmhouse combines elements from tradition and modernity all wrapped up in Italian finesse. This beautiful 3,348 square foot farmhouse has three storeys and can accommodate 11 guests in five en suite bedrooms. 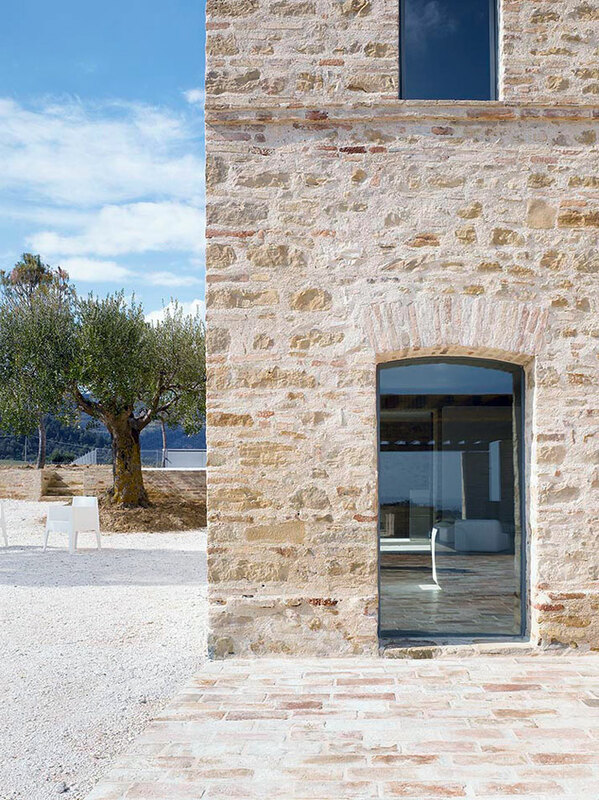 The renovation of Le Marche Villa comprises traditional elements and new interventions either by contrasting materials and textures or by assimilating old and new elements. For instance, some walls are covered with white plaster, and the old wooden floors have been replaced with hard cement screed flooring in white. 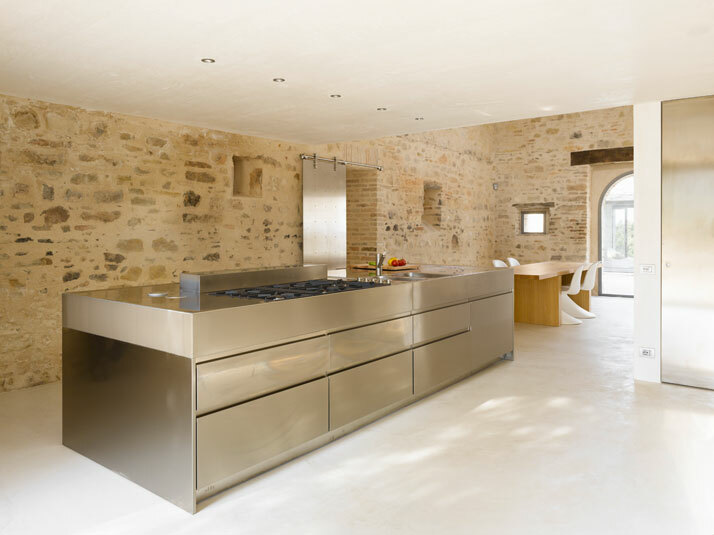 This assists in reflecting the light off of the surfaces which gives a feeling of largeness, openness and airiness. All in all, the property offers four double bedrooms, one twin bedroom, five en suite bathrooms, one kitchen, two living areas, one dining area, three other rooms, a fitness room, and the stunning infinity swimming pool. Its interior décor follows a minimalist approach and includes many designer pieces such as Phillipe Starck bathrooms and a Bose system on the terrace, as well as many other designer pieces. 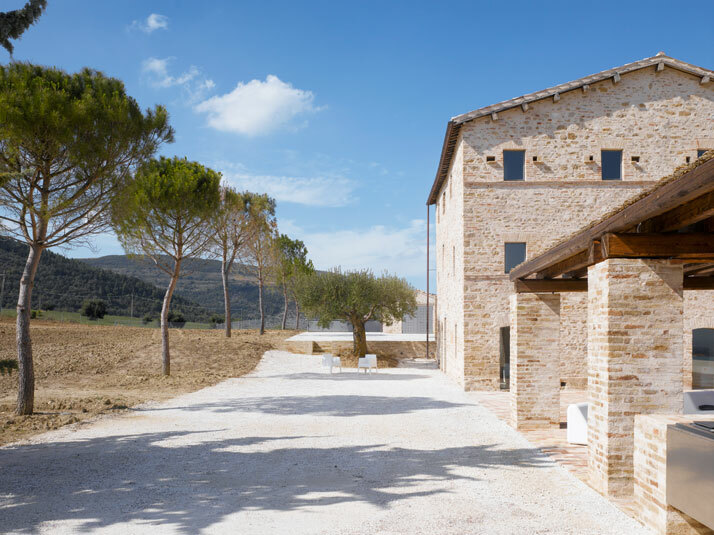 Situated in a panoramic position with a 360 degrees view of the landscape, surrounded with olive trees, Le Marche Villa has only the very best to offer for a relaxing holiday escape into the Italian countryside.